Crawling with history, wholesomely creative and full of personality, Scotland’s capital city, Edinburgh, is my latest destination crush. In fact, I will go as far as saying that, so far, Edinburgh is the highlight of my Wicked Campers road trip and one of the best cities of my 2012 European travel adventure. After three days and nights of exploring this enchanting city, here are eight experiences that I think are essential for an Edinburgh adventure. 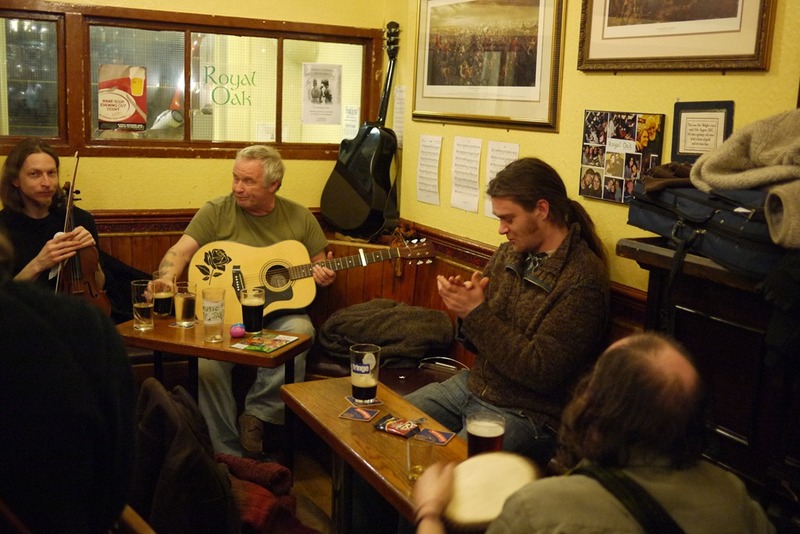 There is nothing like a local musical encounter to make you feel like you’ve met the real face of a place. After a night in The Royal Oak, a small community pub filled with folk music, I felt like I’d seen inside a secret Scottish society. Arriving a little too eagerly at 9pm on the dot, Dave and I wandered into the downstairs ‘lounge’, bought a pint from the rainbow-haired bartender and slid into a booth. At about 9.20pm the first musician arrived and played a few diddies on his guitar. Within the hour, six or seven musicians had squished into a booth, with accordions, fiddles, drums and woodwinds, and were creating some of the most wholesome folk I’d ever heard. That was until I wandered upstairs to the ‘public’ bar, where 20 pint-nursing people were transfixed by Bill and his band. We spent the next couple of hours being wooed by songs of Scotland’s past, songs of love, and even a tribute song about the Australian ANZACS. (Thanks Bill). A truly special evening with genuinely lovely people. Tucked down a narrow stepped alley, just off the High Street tourist trail, this tiny pub was a delightful find. Complete with politic-debating Scotsmen, mid-pub crawl work mates and a couple of tradesmen, this is the kind of pub where you can hear most conversations and decipher few. For just a few pounds, we enjoyed a bowl of stovies, which is a Scottish meal of onions, mashed spuds and minced corned beef, served with oatcakes. Yum! You can have a look at the menu or find the location at the Halfway House website. I have to admit that this experience may be a little tricky to replicate. 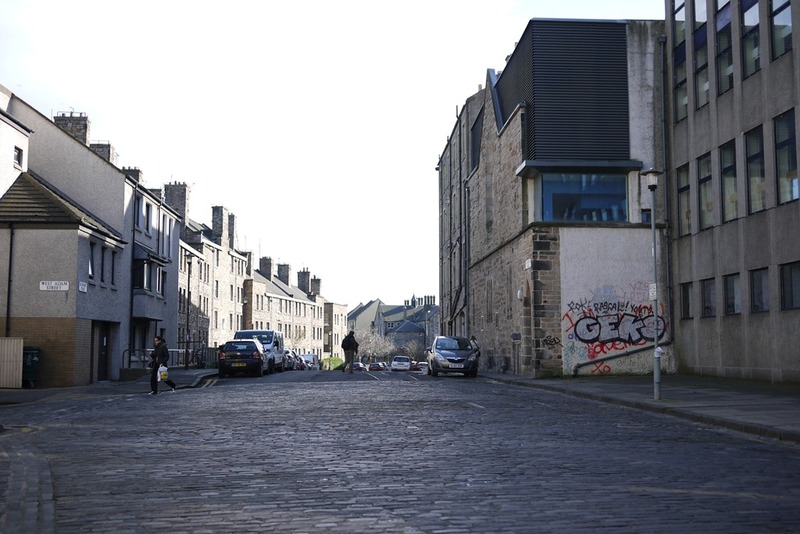 We were walking along Niddry Street on our first night in Edinburgh and looking for the ‘grungy side of town’ promised by the caravan park lady. Through the eerie green hue cast by the Banshee Labyrinth sign, I spotted a sign saying ‘poetry slam tonight’. 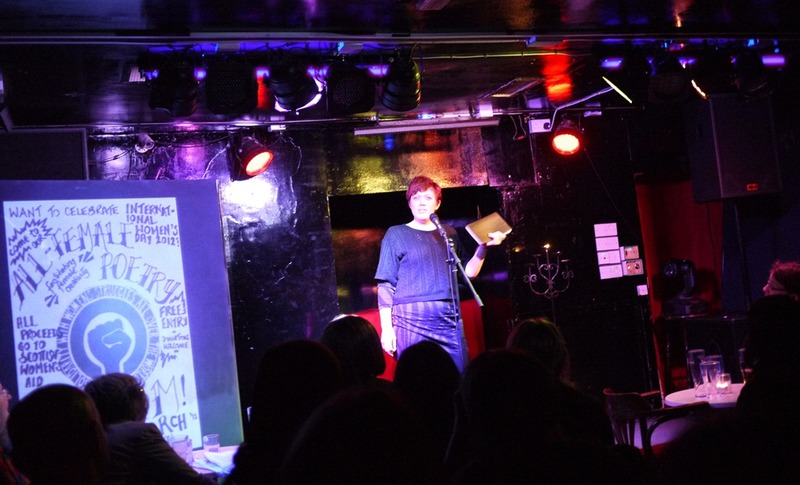 Hesitantly, we crept into the dark cellar to find a group of Edinburgh’s finest female poets battling it out for the International Women’s Day Poetry Slam title. The packed room was rich with red wine and wit, the lights were dim and there was barely enough room to move: in other words, this serendipitous find held the perfect elements for a great night. After three rounds of quality rhymes and licks, local poet Rachel McCrumb was crowned for her potent portrayal of cultural loss and tension. The language-high crowd then mingled into the labyrinth of rooms, all of which seemed ready for a séance or sacrifice. 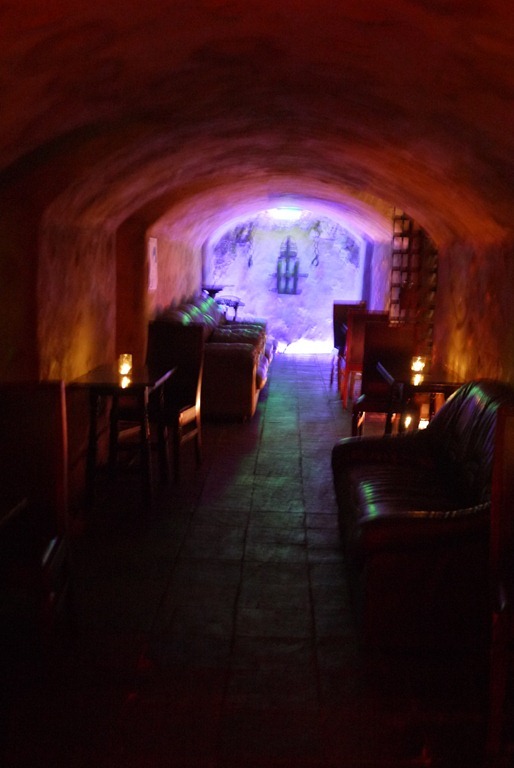 For a similar kind of quirky, creative night that is full of really interesting personalities, check out the Edinburgh events diary on Inky Fingers, Poets on Fire, The Forest Cafe and, of course, The Banshee Labyrinth. 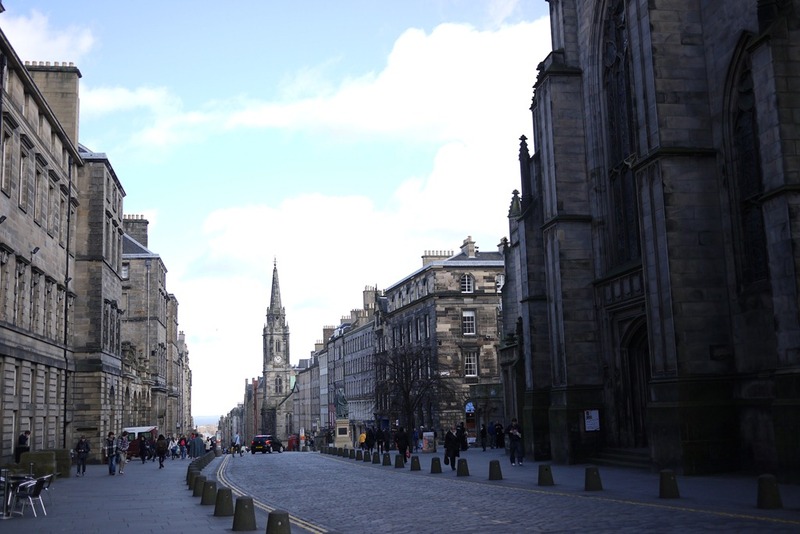 From the crag-top view of Edinburgh castle down to the inner-city wilderness of Holyrood Park, the Royal Mile is a road that takes you through the city, past many of Edinburgh’s historical sites. Although lined by shops that are blaring bagpipe-beats and selling every kind of tartan souvenir you could imagine, this easy downhill walk offers some stunning views and is a handy way to orientate before delving deeper into the wonders of the city. Spending an hour or 3 in Black Medicine Coffee Co. Surrounded by soothing timber furniture, retro lamps, pot plants, an old piano covered in books and inquisitive students, this cafe feels like the love-child of a library and your lounge room. 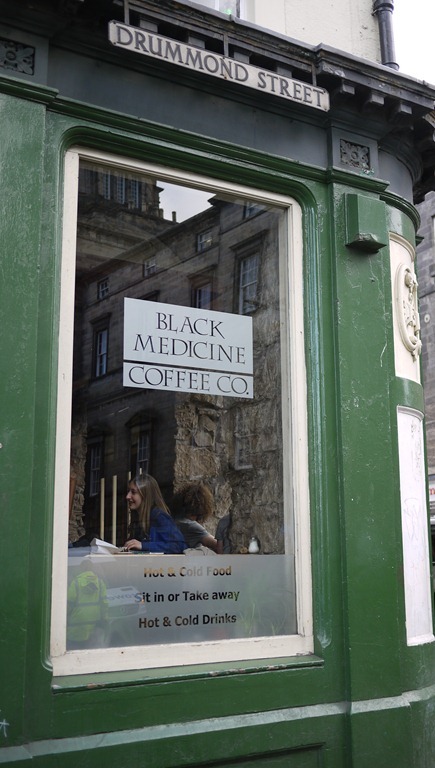 With gluten-free yummies, coffee on demand and free wi-fi (possibly stolen from upstairs) Black Medicine made me as happy as a worm in a book. I do love my cafes and honestly believe that spending quality time reading, writing and people watching with a hot beverage in hand is a very important cultural experience, especially in a city like Edinburgh, where arts, books and music take pride of place in the local social scene. I can still feel the cold air on the back of my neck as the cloaked guide whispered gritty, gruesome and mysterious tales owned by Edinburgh’s streets. 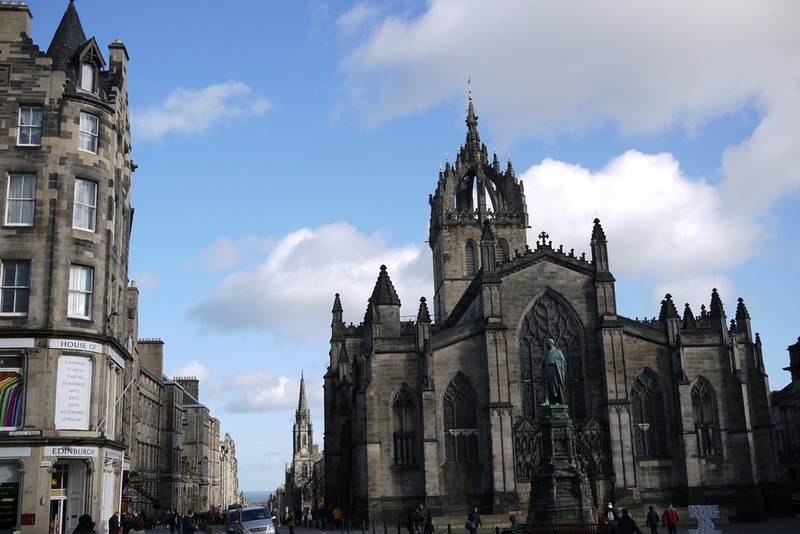 Starting at the mercat cross on the Royal Mile, the evening Mercat Tours Ghost and Ghouls tour weaves through cobbled alleys, past shadowed corners and into the infamous underground vaults built in the 19 arches of Edinburgh’s South Bridge. I was unsure of what to expect from the tour and was mostly eager to see underground. So, I was a little surprised to find myself caught up in the fun of the true local stories told with humour, theatrical flare, historical fact and in-character safety announcements. Bravo Faith. 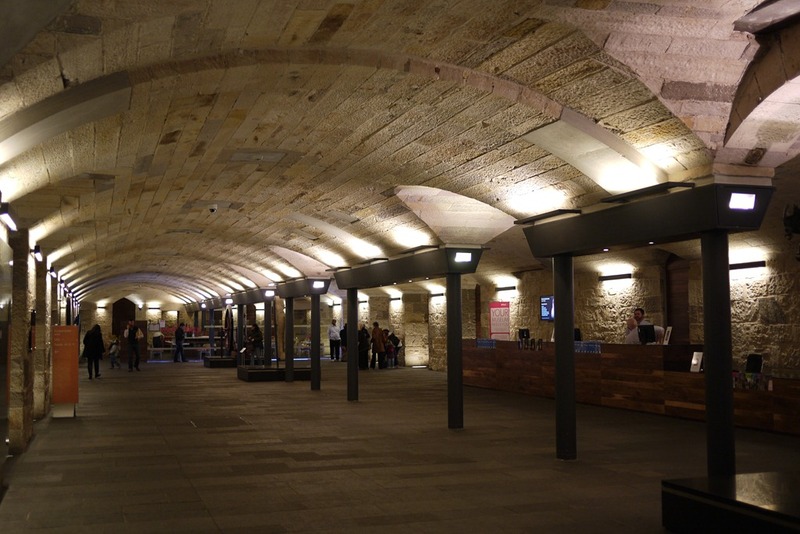 As the tour ended in the vault cellar with a glass of red wine, not only did I feel like I’d learnt a lot about the fascinating multi-storey vaults and Edinburgh’s infamous criminals, I also felt like I’d witnessed Edinburgh’s dark side, beyond the street view. I say ‘attempt’ as this is all I can claim to have done myself. 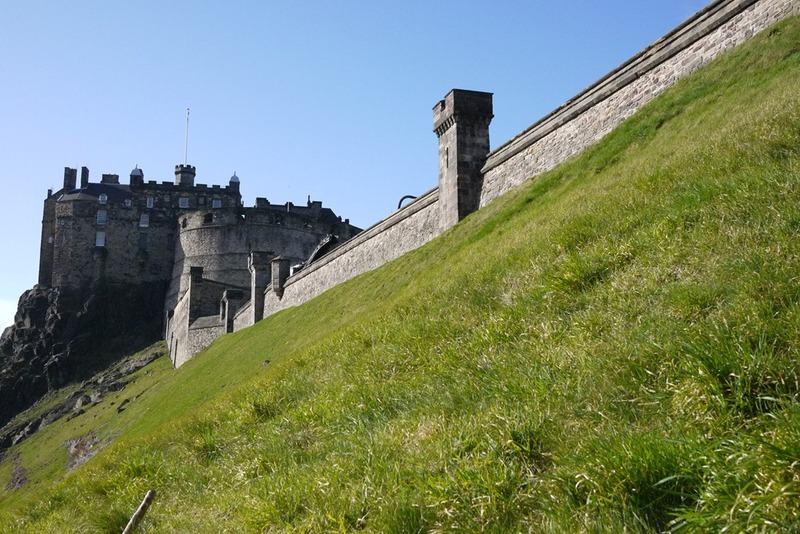 Well known as offering the best view of Edinburg, this amazing rocky mound is walking distance from the city centre. Having heard how good the walk and view was from Arthur’s Seat, Dave and I decided to ‘find’ it on our first afternoon, having done no research and having no directions. We found it (it’s a big rocky mound in a city after all), after wandering through graffitied inner-city apartment buildings, past community gardens and down curly alleys. Once at the base, we could only see a trail heading straight up the side at a gradient too serious for anyone wearing their only dress. So, we decided we’d return the following day, armed with some more information and appropriate walking clothes. Of course the next day was cold and wet but we were determined to seek out these famous views. An hour later, we were still lost, having taken a ‘short cut’ through the underground rail station, been spun around and then followed one of those swivelling sign posts that must have been re-swivelled (or at least that’s what we claim after the fact). Finally, we reorientated and realised we were closer to our starting point than Arthur’s Seat, meaning it was time to cut our losses and do the only thing that we could do in such a situation… have yum cha for lunch. Our two attempts at reaching the seat led us to some amazing parts of the inner city that we wouldn’t have seen otherwise, which just goes to show that often it really is the journey, not the destination, that astounds. Although I’ve not seen it from the top, I have heard so many wonderful things about Arthur’s Seat that I thought this little adventure needed to make it in the top eight. I can’t recall the last time I was so impressed by a museum. While I’ve seen many museums in the past couple of months and the novelty of perusing exhibits is starting to wane, the National Museum of Scotland has renewed my faith in engaging, vibrant and innovative museums. It makes sense that this museum hits the spot. It has just reopened after a £47million redevelopment. The museum map offers a one hour and three hour version of the exhibition trail, but we would have easily spent four hours without seeing everything on show. There is also a little bit of everything: from cross-cultural puzzles, dinosaur bones, space telescopes, F1 cars, Scottish cultural exhibits (including a guillotine, yarn spinners and one of the first pump steam engines) and an interactive technology room. Edinburgh is the perfect city to visit in a campervan. Unlike many other cities we’ve visited, navigating into the city and finding a camping site close to the action was pretty easy. While admittedly we didn’t find any free/wild camping options, we were more than happy to pay for three nights (and three showers!!) at Mortonhall Caravan and Camping Park. The park was clean, good value for money and has super helpful staff that will give you maps, brochures and some local knowledge. But the trump card was the frequent buses that run until 11.30pm to get you between the park driveway and city centre in to 10-15 minutes. Make sure you have the correct change for the bus. When I was there, it was £1.40 per trip (regardless of where you get on and off). Just pop the coins in the machine, tell the driver you want a single and take the ticket from the printer. If you take three or more trips in a day, it’s worth getting a daily ticket for £3.20 . If you get stuck without change, general practise seemed to be asking other passengers for change. On our first ride we had lovely people give us both the correct change and their daily ticket. If you miss the last bus home, a taxi will cost about £10. This was the fare we paid when hailing a black cab in George Street (city) in the early AM (after a great night at the Royal Oak) and taking it all the way out to Mortonhall. Check out The List and The Gig Guide to find out what’s on. While both of these fabulous directories are online, you can buy The List monthly magazine at newsagents (or read it at cool cafes) and The Gig Guide for the week at pubs and venues. Both indicate what’s free and both have shown me the way to a good night. 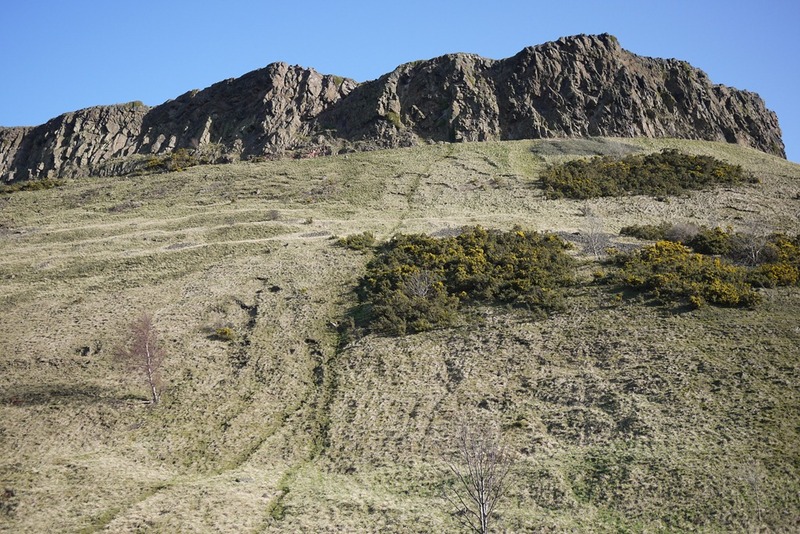 The best info we found about getting to Arthur’s Seat was here. Turns out, the entry is just at the end of the Royal Mile walk. Go figure. Thanks to Mercat Tours for the complementary tour tickets. I loved the tour and was glad for the chance to learn about the vaults, the haunted corners and the mob. Also, a shout out to Wicked Campers UK for the awesome van (Panda) and for making this trip possible. Loving every day of it! Great post. Edinburgh is probably my favourite place in the world besides my hometown. Thanks for reading Inga. Glad it was helpful. Hope you and your family enjoy your October getaway! used to live there. LOVED it. This is a really great post, I really enjoy your blog! Thanks Elisa. Really appreciate your feedback and am glad you enjoy it! Thanks for reading. Glad it can be useful Hayley. I’m sure Arthur’s Seat isn’t that hard to find, we just approached it in the completely the wrong way… twice! Enjoy your trip to Edinburgh! Well, well… I am bookmarking this post for my Euro trip! Thank, Nic! Thanks! Love to hear it. I have lived in Edinburgh for 30 years and still love it to bits. I am always fascinated to find out the reaction of foreign people to the city. I August/early September, the festival comes to town and there is nowhere in the world to compare with the experiences to be had. Also only 40 miles from Edinburgh is Glasgow which is so different and also fantastic. Not many countries of 5 million people have two such fascinating cities so close together. Hi Ian, Thanks so much for reading and commenting. There seems to be so much happening in Edinburgh this year. I was disappointed I couldn’t hang around longer for the Ceilidh and Science festival, both so close yet so far from my time there. I recently visited Glasgow too (next post is about Glasgow – coming soon) and found it to be such a different place with a different feel, yet also full of fun happenings. You are right: there aren’t many countries with two cities of such scale and cultural significance in such close proximity. I just discovered your blog through Freshly Pressed. It’s such a great read! I completely agree with you on Edinburgh. A couple of years ago I was visiting a friend in Galway, Ireland when she asked if we could go to Scotland for the weekend. I hadn’t really ever considered it. I mean, it was on my list of places to go but it wasn’t at the top. As we started our descent into Edinburgh, I completely fell in love. I’ve been raving about it to anyone who will listen ever since. Those 3 days were nowhere near long enough. 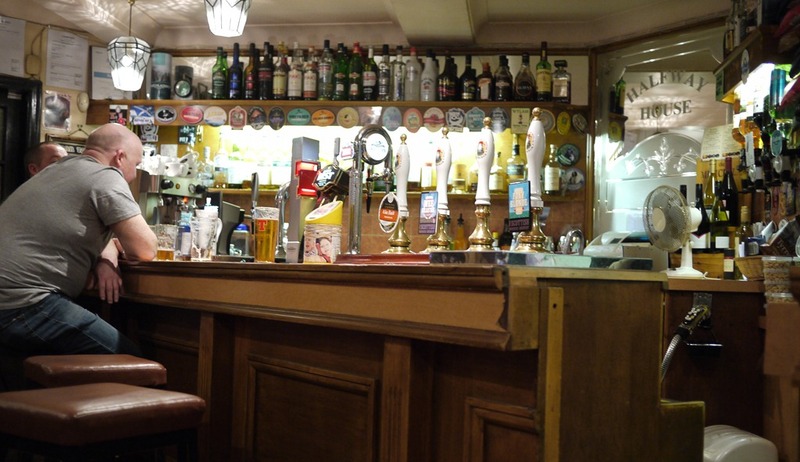 We did find the Halfway House by accident (like The Elephant House) and it is the perfect place to grab a pint. I love those little interesting places you discover when you’re not expecting anything. 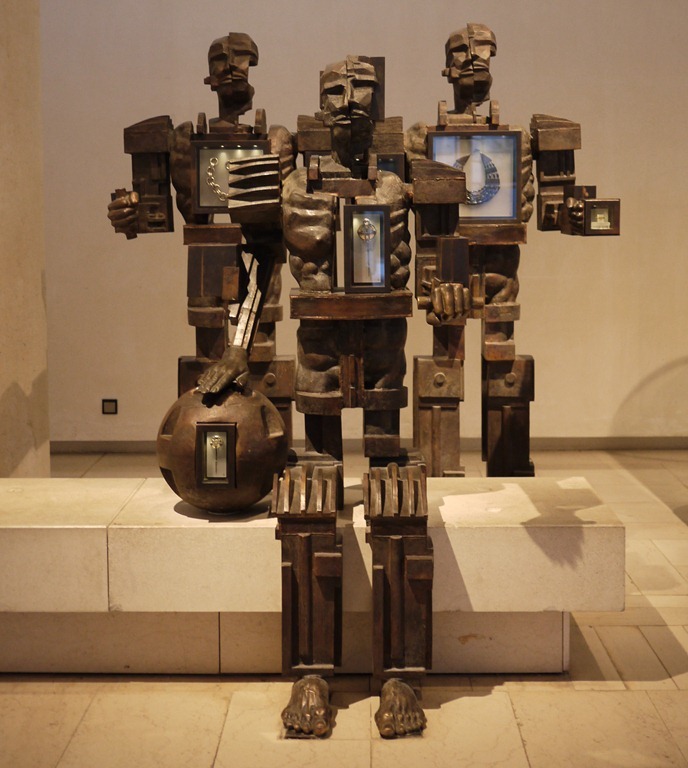 In the museum of modern art in Edinburgh there is a work by the Scottish artist Douglas Gordon(Turner prize winner). It is made up of lists of names on a stairwell. It comprises all the people he can remember meeting in his life and he regularly updated it. I think this is a great idea and especially for people who travel and love meeting people. Lists can be a great way of triggering wonderful memories such as the folks you met in the Royal Oak or Halfway House pubs in Edinburgh. Great tips, Nic! Very helpful. Thank you. And love the photos, too. 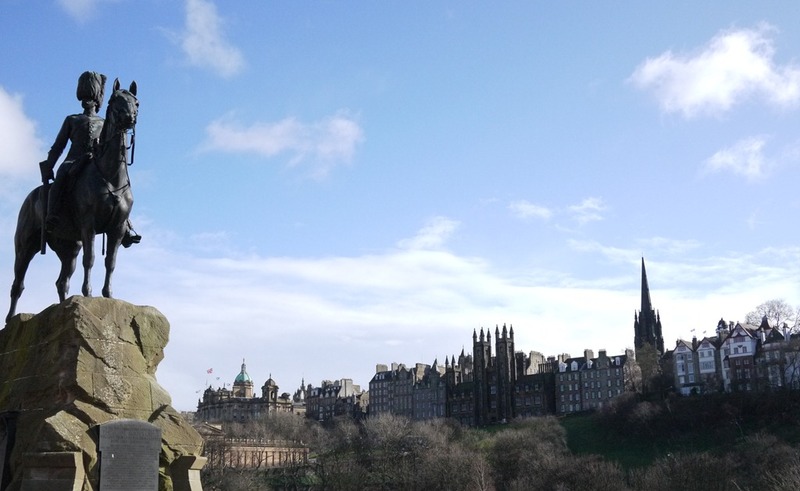 Have just discovered Alexander McCall Smith’s “44 Scotland Street” novel series – and it is fantastic to see these pictures of Edinburgh after reading about the lives of people who “live” there! Thanks! You have really captured the heart of the city with this – both the places you found and the things you did. I’ve lived in Edinburgh my whole life, and I doubt I could have come up with a better few days of city touring had I been asked! Hey Miss G – thanks so much for your comment! I am really glad to know we got a good local experience – it felt authentic but there is always that doubt as a tourist, wondering if you are seeing a different city to those who live there. I can’t wait to visit again. I think you saw the city that residents would love to, but never have, or make the time to. I love that you could see Arthur’s Seat but never quite reach it! Check out http://www.eif.co.uk/speedoflight to see what Arthur will be involved in during the Festival in August. As usual, nice entry! I followed you advice to visit Bologne and had one of the best meals at Drogheria della Rosa. Now, I’ll follow your tips for my trip to Edinburgh and I’m sure I’m gonna like!